Over the next five days, these GeoGirls would camp, hike to field sites and conduct hands-on volcano research projects with female scientists, educators and older students. They would learn about not only natural hazards but also cutting-edge scientific monitoring technologies and how to document and share their scientific findings by building a public webpage. The free GeoGirls program, now in its fourth year, is run jointly by the U.S. Geological Survey and the Mount St. Helens Institute, a nonprofit organization dedicated to the stewardship of the volcano through science education and exploration. In partnership with their scientist mentors, the GeoGirls explore their outdoor laboratory, learning about ecology and ecosystems, soils and groundwater. They map ash and pumice deposits, observe subsurface layers of the volcano using ground-penetrating radar, examine rocks and minerals under a microscope, analyze seismic signatures, and, on their last day, participate in a volcano crisis mission, applying what they learned to a scenario of increasing volcanic unrest. The women scientists are also thrilled to be able to mentor the next generation of possible science lovers. For example, Tami Christianson, a hydrological technician at the USGS Cascades Volcano Observatory, prepped sample jars and ran a line across the Coldwater Creek channel — tasks she has done a thousand times at Mount St. Helens and other southwest Washington locations. Christianson, who studies channel migration and the transport of volcanic sediment, worked with the GeoGirls on sampling techniques while telling them how volcanic sediments from the May 18, 1980, eruption of Mount St. Helens continue to wash downstream, clog channels and increase flooding hazards for communities along the rivers. Angie Diefenbach, a geologist with the USGS Volcano Disaster Assistance Program, had recently returned from a month in Hawaiʻi, where she used Unmanned Aircraft Systems (UAS), or drones, to collect data about Kīlauea Volcano’s lava flows and collapses at the summit. Diefenbach used her expertise to teach the GeoGirls how to use simple, point-and-shoot cameras and photogrammetry software to make 3D models of the terrain. Diefenbach will repeat the process with next year’s group of GeoGirls and track surface changes over time. Kate Allstadt, a geophysicist with the USGS Geologic Hazards Science Center, explained to the GeoGirls how earthquakes move through the subsurface and how scientists track and analyze an earthquake’s movements. To help Allstadt with her research, the GeoGirls designed an experiment that used seismometers to track the passage of lahars — also known as volcanic mudflows — as part of early warning systems. The girls set up a seismic array and collected data from “simulated” lahars — moving vehicles traveling at different speeds — to try out different methods of tracking moving sources. Joining the USGS, were scientists and volunteers from the U.S. Forest Service, Washington State Department of Ecology, Washington State Department of Natural Resources, Pierce County Emergency Management, Central Washington University, Oregon State University, Portland Community College, Portland State University, University of California at San Diego, University of Oregon, GHD Group Pty Ltd (Tacoma), GRI Geotechnical Resources, Inc., Oceaneering International, and Mount St. Helens Institute. USGS and its partners lead projects and clearly engaged the girls with their own love of science. One example? Whereas before the program, most GeoGirls listed geologist, volcanologist, paleontologist, teacher/educator, and physicist, as the geology-related careers they could think of, after the program, the answers were much more diverse. GeoGirls listed 13 careers that they had not yet been mentioned previously, like hydrologist, landslide scientist, drone pilot, and emergency manager, and of those newly mentioned careers, the ones that were mentioned the most were those of the GeoGirls’ adult volunteers. Allstadt began the GeoGirls program in 2014, with National Science Foundation funding of her post-doctoral work at the Cascades Volcano Observatory. The program ignites and encourages girls’ interest in science. The Mount St. Helens Institute oversees the application process, selection of girls, camp logistics and follow-up, including a pre- and post-program survey to assess the GeoGirls’ skill and attitude changes. The 2018 survey finds that while GeoGirls acknowledge that doing science is not easy, 96 percent agreed or somewhat agreed that they enjoy taking on challenges; 100 percent agreed that they know how to collect and study scientific data; 96 percent felt empowered to follow their dreams; 92 percent felt they could overcome challenges and find support from others to help them face their challenges; and 96 percent saw themselves as scientists. The GeoGirls program is free to student participants through the generosity of numerous volunteers and private donors, along with grant funding (in 2018) from the American Association of University Women-Lewis County, Association of Women Geoscientists Foundation, Chevron, EMPOWER Women + Girls Clark County, National Science Foundation, Wheeler Foundation, and many private donors. More information about the GeoGirls program is available online. 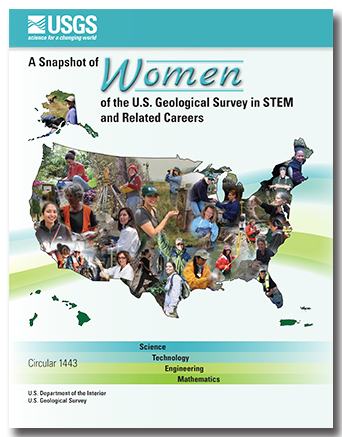 Read more about USGS women in science, in “A snapshot of women of the U.S. Geological Survey in STEM and related careers”.